Established in 1926,The historic Breakers of Long Beach boasts Five spectacular venues for catering; each offering something unique and glamorous. The Historic Sky Room restaurant is a Art Deco masterpiece. Located on the 15th floor, The Sky Room has a spectacular 360-degree view of the city skyline and pacific ocean. Known for being one of the romantic restaurants in the nation, with the ambiance and grace of the timeless the supper club era . Accommodating private receptions up to 240 guests with a dance floor, this unique venue is one of a kind. Classy and sophisticated, our 4 Diamond Chef preparing exquisite meals. The Grand Empire Ballroom, located on the lobby level, is a gorgeous grand ballroom with vaulted ceilings and crystal chandeliers. Accommodating up to 220 guests with a dance floor. A beautiful blank canvas; this room can be transformed into any vision that you can dream up. The Palm Room reception site is located at the entrance level of The Sky Room. 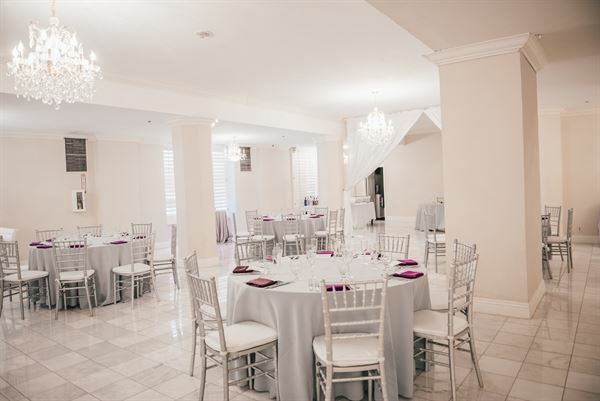 This beautiful room has white marble floors, ivory walls, and can be turned into an incredible location seating up to 150 guests with a dance floor. Cielo, rooftop bar above The Sky Room, is an intimate setting to host weddings, rehearsal dinners or any other cocktail style gathering. Boasting 360 degree views spanning from the Pacific Ocean to the Hollywood Hills. Long Beach's only rooftop lounge, accommodating up to 75 guests. Located on the Arcade level this gorgeous room seats 125 guests for dinner and up to 200 guests for a cocktail reception. A neutral room that can be transformed into any creation you desire. The only open air rooftop bar in Long Beach. Boasting gorgeous 360 degree views from Catalina to the Hollywood Hills. Will accommodate up to 75 people for cocktail receptions. Specialty custom menus available to be personalized to your dining preferences. Conveniently connected to the City Lights Room, the Deja View is our most intimate setting with grand panoramic views of the Pacific Ocean. This room seats a maximum of 110 guests for seated dinners and 150 for cocktail receptions. A true piece of Hollywood glamour. Boasting city and ocean views, an original 1920’s dance floor and a chic black granite bar. Seats up to 135 for dinner receptions and 175 for cocktail receptions. The Empire Grand Ballroom of the historic Breakers Building features vaulted ceilings, mirrored columns, and elegant crystal chandeliers. Dinner receptions can accommodate up to 220 guests or 350 guests for cocktail receptions. This grand room can be tailored to fit the vision of your next special event. Enjoy this imitate dining experience with a grand view of the Pacific Ocean. A perfect space to host a more intimate “round table” reception. Seating up to 18 guests at one large square table or 15 for a presentation. This fine dining room sits atop the historic Breakers Building in the heart of Long Beach. The spectacular views take in the Long Beach harbor, coastline, and surrounding cities. This room is versatile and will accommodate groups of up to 235 guests combined for seated dinners and 300 guests for cocktail parties. The Sky Room consists of both the “City Lights” and “Deja View” rooms listed below. A historically chic, intimate retail wine shop, serving wine by the glass, bottle, and seasonally inspired tapas; located right in the heart of Downtown Long Beach. A warm, modern gothic space featuring original furnishings of the historic Breaker’s Hotel (1920’s Hilton). Will accommodate up to 85 people for cocktail receptions or 30 for seated dinner.